I have been personally struggling with irregular periods, hirsutism, obesity, insulin resistance, ovarian cysts, high cholesterol, pre-diabetes, and gluten-intolerance. I first got my periods when I was 11 years old, and they have been irregular since. Doctors believed that they were irregular because I did a lot of exercise (gymnastics and cheerleading). My periods were irregular in the sense that they would come on and off, or 6-10 times a year. However, when I turned 18 years old and moved out of my mom’s house, different symptoms started to appear. First was the weight gain. I had stopped doing sports because I couldn’t afford going to a gymnastics gym and I was essentially on a student’s budget. I bought the cheapest, easiest, most unhealthy food you could imagine and I started gaining weight. My friends used to tell me don’t worry, it’s normal. It’s called Frosh 15, where you gain 15 pounds the first year you move out. It’ll be fine once you get used to living alone. Except that wasn’t the case. That 15 pounds turned into 50 pounds, and I gained more weight every year. My weight never went down and kept steadily going up. In 2010, I started getting hair on my face. I didn’t know why this was happening to me. I’m a woman, I’m not supposed to have hair there. That’s when I went to the doctor and she did an ultrasound of my ovaries. After the diagnosis, I found out that I had multiple cysts on my ovaries and that I was insulin resistant. But that wasn’t even the bad news. The bad news is that there is no known cure. What does insulin resistance mean exactly? Well, insulin is a hormone that you make in your pancreas to control your blood sugar levels. It acts mainly on fat and muscle cells, causing them to take in sugar when your blood sugar level rises; it also acts on the ovaries causing them to produce the male hormone testosterone. 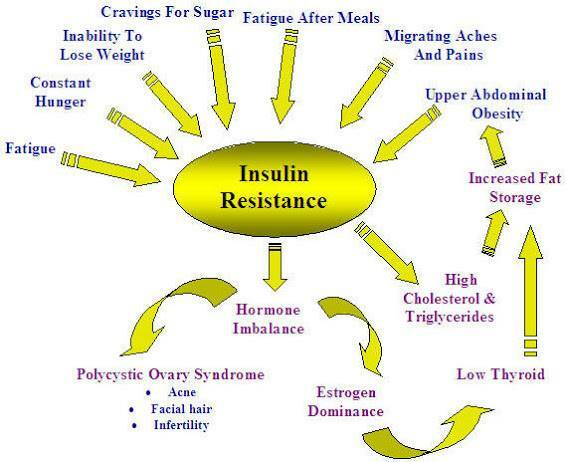 Most women with PCOS have what is called insulin resistance, meaning that the cells in the body are resistant to the effect of normal level of insulin. More insulin is then produced to keep the blood sugar normal. This causes the ovaries to make too much testosterone, thus the facial hair, the thinning hair on scalps, and the irregular periods. Increased insulin also causes weight gain in the abdominal area because the over production of insulin turns into fat. Doctors believe that the underlying reason of PCOS is insulin resistance. The constant weight gain wasn’t good for me. It isn’t good for anybody. Because of it, my hirsutism became worst expanding everywhere on my face creating this “man beard”. It’s embarrassing. No, it’s humiliating. Having facial hair really hurt my self-confidence and self-esteem. I didn’t have a boyfriend and I was too scared to approach guys that I had a crush on. I had a male friend in university who asked me if I was a lesbian because I never had one-night stands or had a boyfriend…When people say stuff like that, it’s really hard for someone to overcome it. My self-confidence was as low as it could be. I decided to never approach guys again until I would regain my self-confidence and find a way to deal with my facial hair. You can read more about my facial hair here. While in university, most of my friends probably noticed that I had facial hair. I mean it was obvious. This facial hair is called hirsutism and is one of the most common symptoms of PCOS. Because women with PCOS have insulin resistance, it causes the insulin to act on the ovaries and this causes them to produce male hormones, creating more testosterone. This means that shaving, plucking, trimming, waxing, or bleaching will not, cannot, fix the problem. It only makes it worse. I’ve seen hundreds of girls on PCOS forums posting that they didn’t know what to do anymore because they have to shave twice a day and still see a five o’clock shadow 2 hours later. Some wives even joke that they have a bigger beard than their husbands. At least they have a sense of humour. My friends always told me to shave or wax my face. I did. Trust me. It only made it worse. The hair came out thicker, longer, blacker than ever before. Imagine having hair that is high on testosterone and hair that you’ve never had before suddenly appear in places you didn’t know hair could exist! I plucked every day for hours and by the end of the day you could feel my prickly cheeks and chin. In 2012, I decided to take all of my money and get laser hair removal. I had 8 painful treatments in 1 year and they all came back…triple the amount. Not only did they all come back, but more of them started growing in spots I didn’t used to have hair in. The laser technologist then told me that electrolysis would probably be better a better option since electrolysis is the only real permanent option, whereas laser hair removal isn’t. Apparently, laser hair removal puts too much electric current and stress in your pores that it can cause an even bigger hormonal imbalance, stimulating the hair roots will cause those hormones to sort of fight back and make more hair, at least that’s what an electrologist told me. As a student, electrolysis was simply out of the question as it was far too expensive. I had wasted all of my money and my face had gotten worse. You can imagine how I felt. You can read more about electrolysis here. I think the hardest part of having PCOS are the people around you. They don’t fully understand what is happening and try to give you advice that doesn’t work like it would on a normal person. I’ve had guy friends telling me to just lose weight, just don’t eat for 2 days, just puke, just cut half your calories, and so on. These friends didn’t understand that us ladies with PCOS fight these cravings every day. We want to eat carbs and sugar, and to diet is extremely hard and takes a lot of self-control. We fight this urge every day. When someone has an illness, they can’t just cure it like that. It’s like telling someone with Coeliac Disease to just take a pill and all of their symptoms will be gone, or that it’s okay if you eat these gluten-free toast because they’re made with gluten-free ingredients, except these toasts were toasted in a toaster that toasts normal bread and cross-contamination can make a person with CD so much sicker. PCOS is a visible and invisible disorder which sometimes makes it hard for people to understand. It’s not going to disappear in one day. No, we have to work hard, much harder than a normal person, to make the symptoms lessen, but unfortunately they will never fully disappear. I gave up dealing with my facial hair while in university, at least until I could find a job where I could afford electrolysis treatments every week. Starting in late 2014, I started researching more and more about PCOS and how it affects our bodies. I finally understood that the more carbs I ate, the more my symptoms got worse. I basically had to start eating like a diabetic. A normal person’s daily carb intake should be about 250g-350g, but eating that many carbs while dealing with PCOS makes everything worse. I have found that the correct amount to eat and not have any symptoms is between 0-75g of carbs. The insulin levels in the blood go up after eating carbs meaning that your weight can increase, your hirsutism can go out of control, your cholesterol, blood sugar, blood pressure all go up and it essentially can make your diabetic symptoms worsen. It turns out that women with PCOS generally crave carbs. A lot of them. I can attest to that. It is so true. I think the number one goal for women with PCOS should be to regulate their insulin levels. This can be fixed by medication that diabetic people use like Metformin, but I personally think that medication isn’t always the best choice because it doesn’t actually heal you, it just lessens some of your symptoms. Metformin and other drugs have so many side effects, it’s ridiculous. I think that eliminating as many carbs as you can will help regulate insulin, help you lose weight, and help balance those hormones. I’ve never been good at doing diets, hell, I hate the word diet. That’s why I started experimenting on various food and found that my body felt much better when I ate gluten-free and sugar-free. In July 2014, my mother and I decided to eat all organic to see if there would be any noticeable changes. Well, surprise surprise. I got my periods that month. Ever since I started gaining weight, my periods came maybe 2-5 times a year if I were lucky. I never, I mean never, got them twice in a row. Sometimes they would only come once a year. Now, the first month we ate organic was in July 2014 and I got my periods. It could’ve been a coincidence so I waited until the next month. I got my periods AGAIN. I ate organic in September too, and my periods came again. That was 3 months in a row where my periods came naturally and all I had to do was eat organic. Unfortunately, I had just graduated from university and didn’t have a job just yet and my mom didn’t have lots of money so we had to quit the organic diet. Organic food can really add up. I stopped eating organic at the end of September and my periods also stopped coming. I randomly got them back in December 2014. 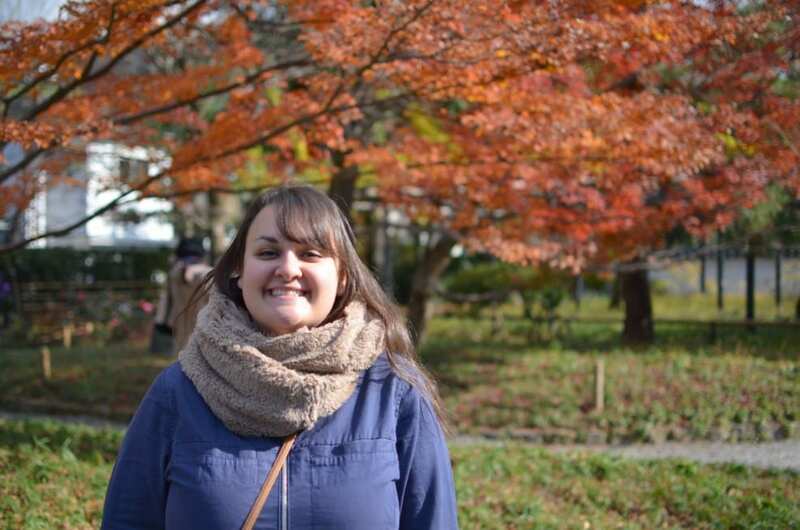 In January 2015, I got a job in Japan and moved there. 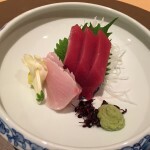 In Japan, the food is made with much less pesticides and no growth hormones than the ones in North America or Europe. To give you an example, eggs in N.America last a good 1-1.5 months. Here in Japan, they last about 10 days. The vegetables you buy here rot much faster than the food back home. The meat I buy at the grocery is good for about 2 days and then it’s rotten. Back in Canada, I would always buy 2 weeks worth of groceries knowing the food will still be good, but during my first week in Japan, I bought 2 weeks worth of groceries and everything rotted 4-5 days later. I always see pictures on Facebook of people meal prepping for the week where they prepare food and leave it in Tupperwares for 5 days. I can’t do that because 3 days in, the food starts to taste funny and you know it won’t last 5. I’ve been living here since January 2015 and guess what? I have gotten my periods every single month since. I now definitely know that the poison they put in our food back home is making us sick. If I ever go back to Canada, I will ONLY eat organic. I decided to only eat food grown in Japan, nothing from abroad, and only eat organic. I started a period tracker and I’ve been registering my basal body temperature every morning. My periods cycle alternate between 28 days to 34 days. I also ovulate every month . That is absolutely amazing, right? Just by changing what I ate, my periods came back naturally without taking any medication. As for my hirsutism, with the new job that I have, I can finally afford to go get treatments. I started my first treatments in March 2015 and went once a week for 45 minutes. In October 2015, I started going once a week but only for 30 minute sessions. In February 2016, I started going 3 times a month instead of 4-5 and did 30 minute sessions. My hair has slowly been disappearing and my face is now normal. In June 2016, I started going once every 3 weeks, and in September 2016 I started alternating between once a month or once every 3 weeks. In January 2018, I’ve been going once every 5 weeks. When I go, it’s only to get the little persistent ones that keep on coming out. You cannot see any facial hair on my face right now as it is all clear. The hairs that do grow back are short, light-coloured, and not thick. Their roots are also slowly disappearing. For your information, 5 hours costs about $650 CAD so it’s not exactly cheap. Electrolysis zaps one hair at a time with an electric current for 5-10 seconds, whereas laser hair removal can do your whole face in less than 5 minutes. I was reading this website for trans-gendered people that went through electrolysis to get rid of their beards and it said that it usually takes 2-4 years of treatments to get rid of all the facial hair. You first start with treatments every week (once or twice) and it eventually decreases to 1 treatment a month or every couple of months, to no more treatments at all. As long as I have a job, I will be continuing my electrolysis. This has given me so much more confidence as a woman and I feel much better about myself. As for my weight loss, I started to watch what I eat. I started to buy organic food from local farmers in February 2015. I also started to watch my daily intake of carbs and try to limit myself to 75g of carbs a day or less. I don’t really look at calories, just carbs. I stopped eating sugar and replaced it with stevia powder, erythritol and monk fruit powder. 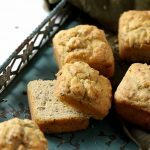 I stopped eating gluten and have been trying different recipes using nuts and seeds flours. 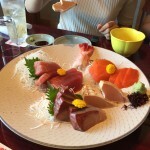 Living in Japan has been quite hard in finding different gluten-free versions of food because Japanese people are not accustomed to people with these kinds of dietary needs. Japan has a very carb-heavy diet. They love bread, rice, deep-fried things, and put flour and sugar in literally everything. I allow myself one cheat day per week because if I didn’t, I would quit right away and go back to eating unhealthy foods. 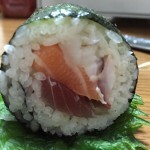 But on this cheat day, I don’t necessarily eat gluten, more like I eat something that I’ve been craving like sushi. 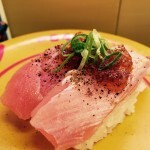 When I say sushi, I don’t mean the sushi we serve back home, no, I mean Japanese style sushi. Nigiri or sashimi to be exact. The fish is much larger than the rice and there is nothing else like breadcrumbs and spicy mayo or random stuff you’ll find back home. I don’t eat gluten or sugar at all. Not even on my cheat days. If I do eat something with gluten, I now get diarrhea and tummy aches which leads me to believe that I was actually gluten intolerant all this time. A lot of sites suggest that women with PCOS should avoid eating dairy products. This is because dairy products contain the A1 casein which causes inflammation, which is not good for PCOS. But, having said that, not all cows produce this casein. Only Holstein cows do. Jersey cows, goats and sheep produce the A2 casein which is fine for most people. (You can read more about dairy here). I originally stopped eating dairy for about 4 months and didn’t notice any difference. I then ate dairy only from Jersey cows for about 6 months and again didn’t notice any difference. That is why my recipes on my site still contain dairy. I’m always told that if you have PCOS, you’re supposed to quit dairy, but I’ve never actually noticed or felt any different without dairy so I have not quit it. I now eat regular dairy from any animals from time to time and I’m still losing weight and my health is still normal. So far, I haven’t seen any reason to quit it. If it affects you negatively, then of couse, quit it. But for me, I was fine with it. I only use cream, yogurt and cheese. I’m currently working on a “diet” plan that will be totally organic, gluten-free, sugar-free, processed food-free, low-carb, low-calorie, sometimes paleo and that WILL involve meat, vegetables, fruits and dairy in moderation. I would really love to eat lots of fruits, but unfortunately they are high in carbs AND they aren’t really available in Japan. I mean they are, just ridiculously expensive. (For example, 1 small watermelon costs 10-50$). This is what this site is for. 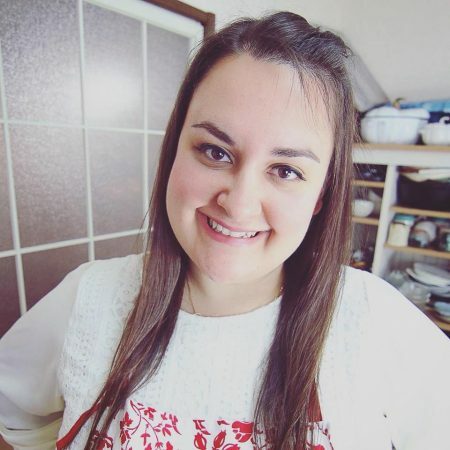 I will upload all recipes that I know are extremely healthy for people with PCOS specifically, but also for people who follow a gluten-free lifestyle, paleo, ketogenic, or just want to lose weight, etc. I have found that exercise also helps improve PCOS symptoms. I have to admit that before coming to Japan, I was in the worst shape of my life. I remember in high school, I was in the gymnastics and cheerleading team, I could run for 5K and do unlimited amounts of conditioning. 1 year ago, I could barely run 100 meters. I still have muscles and can manage about 50 sit-ups or 20 push-ups, but I would like to get my stamina back up. Ever since I moved to Japan, I have been biking everywhere I go. I barely use the train, unless I go into Tokyo. I bike to work, home, to the grocery, to my friend’s house, etc. Back in Canada, I tried to bike for 10 minutes and I thought I was going to puke and pass out. I can proudly say that I can now bike 20km without taking a break. I think that if I continue to bike everywhere and add a bit of conditioning here and there, that I will be able to lose weight in a healthy and safe way. I recommend to anyone with PCOS to do at least 20-30 minutes of exercise every day. It honestly really does make a difference. I actually joined a gym and take their cardio kickboxing class every week! It doesn’t really feel like exercise which is why I love it and I burn so much fat or calories with it! 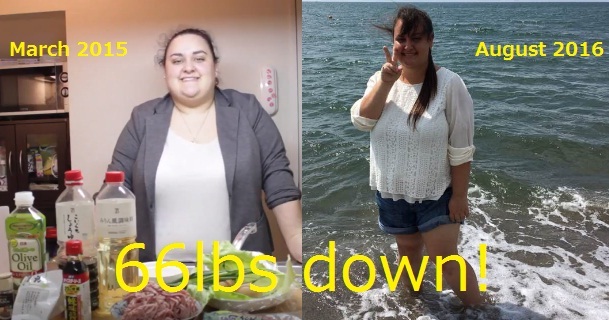 So far, I have lost 95 pounds since March 2015 and I think that that is a healthy steady rate. My blood pressure is now normal 109/69, whereas it was 145/90 in December 2014. My dark patches on my skin from the insulin resistance have completely disappeared. I am no longer pre-diabetic. My ultimate goal would be to lose 7 pounds a month, but we will see how that goes. I would like to weigh 145 pounds as I think this is a healthy weight for a 5.4″ female and want to try to reach that weight in the next 2 years. 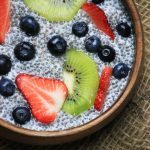 My goal with this blog is to create recipes that are mouth-watering, but that are also healthy and good for you. Just because I crave a burger, doesn’t mean that I should quit my diet. No, it only means that I have to create a healthy version that I will be able to enjoy 100% more. Ever since I changed my lifestyle and my diet, I have felt more energized, less grumpy/cranky, felt more healthy, and I’ve been able to do more things that I couldn’t do before. I will continue living like this and will update this site whenever my body has changed. Thank you for reading this. PCOS isn’t something I publicly talk about, but I feel that with my recipes that I have developed, I can help other cysters out there get healthy. I’m not done losing weight and I still have a long way to go, but I know that I can do it, and if I can, so can you. If you would like to read about my latest health update, you can check out my post here! I wrote a post about my progress after going for a check-up at the doctors! Hint: I was asked, are you sure you have PCOS? This is such a good a food read. I don’t have the classic signs of PCOS but I have no periods, have no energy and have cravings for carbs. This is the probably the only article where I’ve felt that I can relate to. 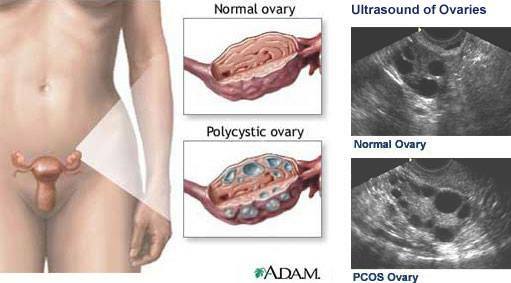 I thought the symptoms I had was just part of being a woman but it really is down to my PCOS. I want to make a change, and make myself feel better. My daughter has PCOS and she is 21. She always had beautiful long thick hair until she became a teenager at around the age of 16 she started noticing all these signs. She lost all of her hair, gained tons of weight and now cannot her her hair back. She paid for extensions to look beautiful again she told me. She is always Beautiful. She has a horrible diet and snacks all day and pounds the carbs. After reading all of this and seeing how it can affect her in the future years, I begged and pleaded to her to please start exercising and cut down the carbs. She just committed to optavia and I pray she will see a difference. All she wants is her hair to come back. Thanks for your inspiring story- it truly meant a lot. Hi, I was diagnosed with PCOs and Im so devastated I cry a lot between wanting children one day and losing my hair, I lost about 70% of my hair. I went to see dermatolgoists three different ones over the years and no one diagnosed me correctly. I cant sleep now, I was able to sleep much better in past but the last month I have bad insomnia!!! I stopped eating dairy the last 4 weeks and gluten is longer. I do get my menstruals but theyre very light and now Im getting more pain..I never ate organic to be honest, it costs so much and I was always told whats organic isnt really organic. I live in the USA. I need help, anyone please!! you are so amazing and brave to tell your story, like most of us women who suffer from pcos is not something we broadcast. But hearing your story gives me hope. I’ve had pco as long as I can remember and I’ve been trying to convince for 2yrs with no luck. Your experiences has inspired me to move forward with trying to live healthier and try again for a family. I cried finding this blog!! I am so grateful to you that you have put these amazing resources together. I’ve only just been diagnosed with PCOS, and I immediately knew that I needed to change my lifestyle. I’ve had 4 kids, but couldn’t understand why I struggled so hard to have them, but many of my other symptoms didn’t start until I had my last child. I typically never comment but your post was so uplifting and inspiring, I am near to crying! 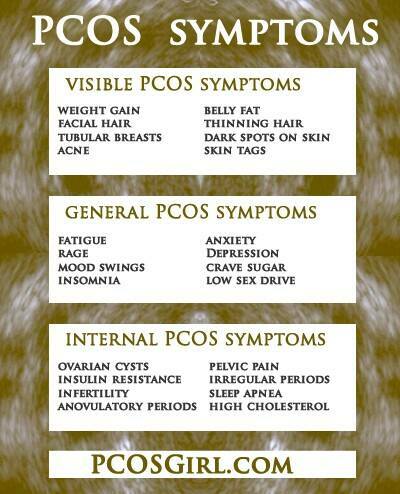 I have suffered with so many PCOS relates symptoms since I was a kid. My story is long and so I will spare you the details but, I am looking forward to anything you have to write from your journey with PCOS in the hopes that you can help so many people like you and me. So happy that you are feeling stronger and healthier. Your story is an inspiration. Thanks for all the recipes. I got so overwhelmed by emotions reading your story, Mira. As anyone with PCOS knows, it’s such a long and difficult journey… filled with hopes that keep getting dashed whenever a new symptom or setback appears. Literally every part of life is affected. When I was younger, I used to wish so badly that I could feel free like other girls, even for a day. 15+ years later, I still have to keep my chin down all the time for fear of the hair growth catching the light. I have to play coy and turn away when my husband tries to touch my chin like they do in romantic movies. I have to shave in a hurry when he’s not around, and have cut myself once or twice by accident. I don’t know how many hours I’ve lost on the Internet looking for ways to deal with acne, stretch marks, hyperpigmentation, hair loss, overactive sebaceous glands. This diagnosis makes it so hard to feel beautiful. I went keto 2 years ago on a whim, and lost 60 pounds even without adding in the gym. I stayed under 100 grams of carbs like a fanatic. This is the first time in my life that I’ve managed to keep the pounds off. I got my hair loss under control with ketoconazole shampoo (lol..keto diet with keto shampoo), and now I’m working on the skin issues. It’s a struggle indeed to reign in this beast of a disorder, but I’m so glad there is a community of support out there to help with the fight. Stay strong, sisters, and much love. Your story sounds so close to mine I started to cry. Everyday the hair on my chin and neck are getting worse and worse. I keep my head down as much as possible and god forbid my husband tries to touch my prickly face. It is absolutely humiliating! I always wish I could just be normal. Not only do I have to worry about constantly getting rid of the hairs but when I do I have awful red bumps all over the area so you can really tell. I too did keto and felt so much better then but haven’t been back on it since before the holidays. I’m thinking that’s what has made my symptoms so much worse lately is not sticking with it anymore. Well its nice to know so many other women are dealing with this. The depression and anxiety are such a struggle. I definitely relate to the self esteem issue. I’m 33 and was diagnosed at 15 with PCOS, it’s ruined my life. I am so obese and I haven’t found anything that has worked. I’ve tried numerous diets, along with cardio 1.5hrs a day Monday thru Friday for 10 months…I lost 15lbs. It’s so discouraging. I am thankful that laser treatments worked for my face I had such a thigh black beard and size burns. I use to pluck and bleach for hours. I just do maintenance now. I unfortunately am thinking of gastric surgery but I don’t even think that would work. 2 years ago I got really sick and we found out that I have Graves’ disease (hyperthyroidism) apparently you’re not suppose to keep weight on with that. I never lost a pound. I’m afraid I’ll be stuck like this forever. Not married, no relationships, no kids in sight. I’m glad it worked for you though best of luck! Thank you so much for all the information!! I have yet to try your recipes, but look forward to trying them! I have had PCOS for 2 years diagnosed and probably have honestly had it a lot longer than that. My husband and I have been trying to get pregnant for quite some time and I am going to take all of your information and put it towards my every day life! Your site and information, I’ll forever be grateful for and use! I have had PCOS All my life, irregular periods, hirsutism acanthosis ( darkening of skin in armpits, groin and neck) . The maximum i have ever weighed was 120 pounds. It killed my self esteem as a teenager and a young adult. I am now 46 years old, a physician , and i now weigh only 92 pounds. I eat largely grain free ( i am terribly gluten intolerant) , vegetarian and low carb. I have never felt or looked prettier in my life. It has been a long journey, but keep at it and you will get there. I was diagnosed in the mid 90’s. I was told having children would be a problem, but since I didn’t want any, no problem, right? This seemed weirdly wrong to me. If your body can’t produce children, isn’t something–or many things–terribly wrong? My doctor put me on The Pill and acted flippant about my symptoms. There was no internet at the time (okay, we had green screens and creepy chat rooms), so the information I could find was extremely limited. I gained weight with ease and had developed Pre-Diabetes by age 35. I completely freaked out (as one should with this diagnosis), and researched like a med student. I know more than every Nutritionist I’ve ever seen. I am not Pre-Diabetic now, no thanks to my doctors or dieticians, but thanks only to my research. Medical studies are sparse, but stories like yours abound. In short, keep speaking up. Don’t be quiet. People need to hear you. Thank you. Hi Mira! I’m encouraged by your story! I was diagnosed with PCOS 10 years ago and have done all sorts of medication and treatments. Just recently, I decided to go low-carb and I feel great! My energy is more steady, I lost a couple of pounds just in the first weeks, and my cravings have almost disappeared. I did low-carb when I first was diagnosed and forgot how powerful and important it is. I’m excited to see how it will help with the other PCOS symptoms. Thank you for sharing your story and being a resource! Wow! This is so awesome! Congratulations on changing your life for the better! This is so inspirational because I was recently diagnosed with PCOS as well and there are so many things that go with it as you mentioned. I am very big on nutrition and it really makes me think of all the things in food nowadays that actually hurt you more than helping. I am currently on the Paleo Diet, and I shouldn’t say “on the Diet”, but instead I have changed my lifestyle to eating this way. It’s true that you feel better and are naturally curing yourself which is amazing! 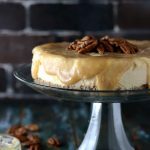 I appreciate the recipes that you are creating and blogging about because it helps to make this diet lifestyle change more fun and appealing!